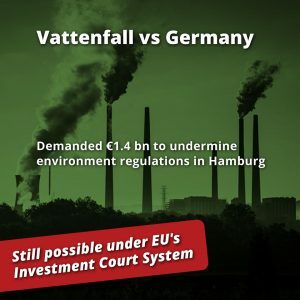 Published by : Canadian Centre for Policy Alternatives, Corporate Europe Observatory, Friends of the Earth Europe, Forum Umwelt und Entwicklung (German Forum on Environment & Development) and the Transnational Institute. In autumn 2015, the European trade commissioner, Cecilia Malmström, launched a proposal to give far-reaching rights to foreign investors in all future EU trade agreements. 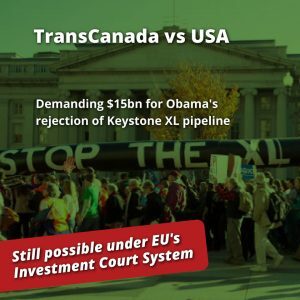 The proposal came in the midst of growing public concern over the inclusion of Investor-State Dispute Settlement (ISDS) mechanism found in EU trade agreements such as the US-EU Transatlantic Trade and Investment Partnership (TTIP) and the EU-Canada Comprehensive Economic and Trade Agreement (CETA). This mechanism, applied in many existing international trade and investment treaties, has seen a surge of controversial cases launched by corporations against states that have taken regulatory action to defend public health, the environment or the public interest. 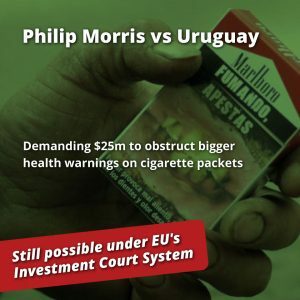 The Commission promised that its new approach to investment protection – outlined in the Investment Court System (ICS) proposal put forward in the TTIP negotiations – would “protect the governments’ right to regulate and ensure that investment disputes will be adjudicated in full accordance with the rule of law.” Members of the Commission promised that some of the most egregious cases, which have come to symbolise the injustices and wrongs of ISDS, would no longer be possible under the “reformed” system. 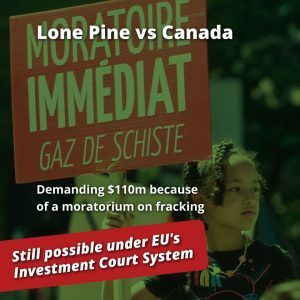 This report puts that promise to the test by examining five of the most controversial ISDS cases from recent years. 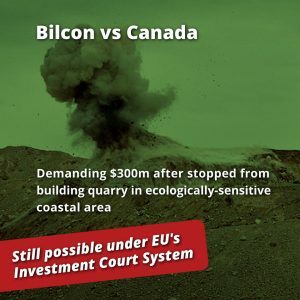 Bilcon vs Canada for an environmental impact assessment that prevented the construction of a large quarry and marine terminal in an ecologically sensitive coastal area. 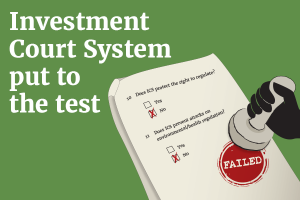 We wanted to test whether these cases would no longer be possible under the Investment Court System (ICS) in order to understand whether it represents a substantial change from the current iniquities of ISDS arbitration. Or whether, as many legal experts and civil society advocates have argued, the European Commission is merely carrying out a rebranding exercise. Close analysis of each case shows that every one of these controversial disputes could still be launched and likely prosper under ICS. There is nothing in the proposed rules that prevents companies from challenging government decisions to protect health and the environment. And there is nothing to prevent arbitrators from deciding in their favour, ordering states to pay billions in taxpayer compensation for legitimate public policy measures. In other words, put to the test, the Investment Court System would fail to prevent any of these controversial cases from happening.